PaintMee is the world's most advanced automatic painting generator. Unlike any other software, paintings are actually PAINTED stroke by stroke, smoothly animated, starting with an empty canvas reaching incredible results. Note: If you don't require the PRO features listed at the bottom, get the basic version instead as it's lower priced. PaintMee shares many powerful features with its forerunner, SketchMee, which was ALSO selected by Apple as a worldwide, major front page feature app on the Mac App Store, March 2011. It's awesome, be sure to check it out if you haven't already. PaintMee is the next generation in this new breed of art generating software making in-depth analysis of the source photos, then building the end results from scratch, not reusing any pixel data from the source. The finished paintings are stored internally as complete 3D models made up of thousands of separate paint strokes, each an infinitely well defined 3D object. • Zoom in to inspect the paint. Paintings appear perfectly sharp at any zoom level. • Reapply the same settings any number of times, every time getting a new, different and unique painting. • Change the light source position to change the appearance of the paintings. 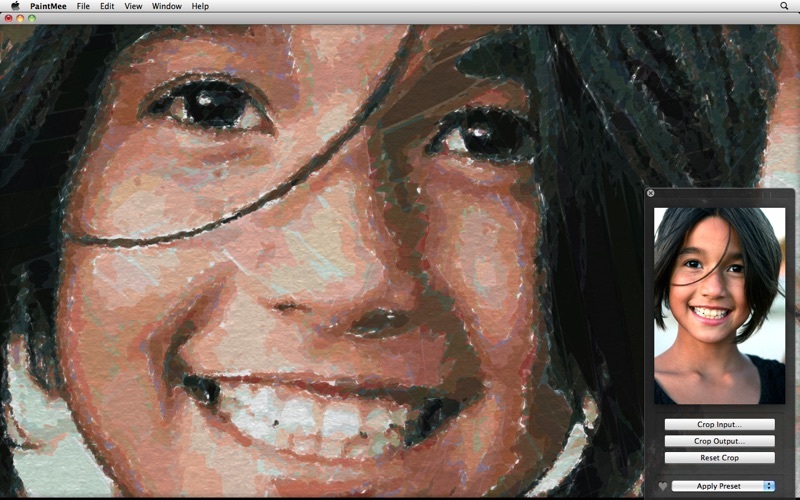 • Create sharp, full size 128 megapixel paintings using tiny low resolution source images as input. • Crop the resulting painting as much as you like. You can always save the remaining part as a sharp 128 megapixel image. • Open any photo. 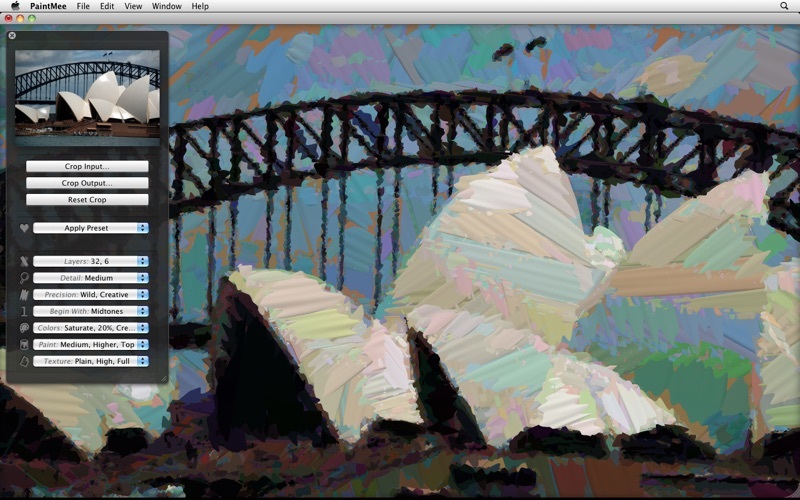 Or paste or drag it into PaintMee from iPhoto for example. • Try the 10 example parameter presets by hitting Cmd-1, Cmd-2 etc. • Explore the small set of powerful and well balanced parameters, using only simple multiple choice popup menus. 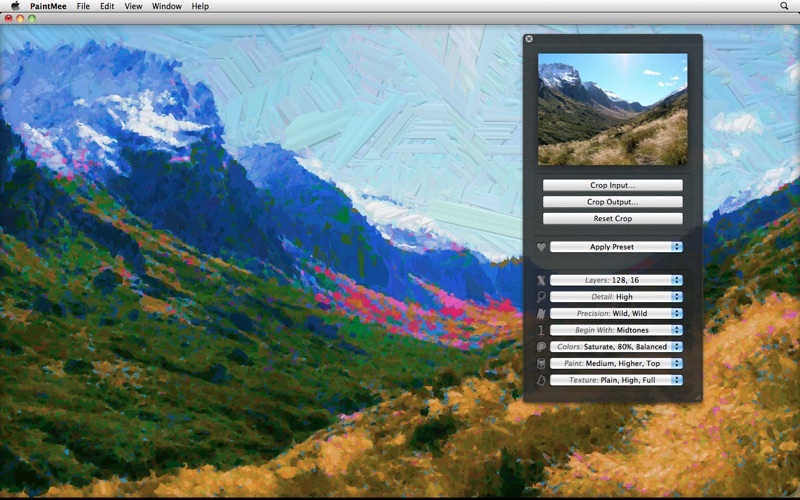 • Save any painting as a 128 megapixel high quality image, regardless of input photo size. • Every processor core in your Mac is put to work. Even if you have many! • The animation uses your graphics card, making it smooth even while the heavy number crunching takes place. • Tons of optimization work to make the engine runnable on iPhones and iPads, makes it FLY on Macs. • Careful design keeps the application responsive at all times. No waiting for the spinning ball cursor! In fact, it's so fast we provide you the option to lower the painting speed for a more relaxed or even meditative watching experience. Use a slider to exactly control how fast you wish the painting to be completed, from as-fast-as-possible (seconds) up to 1 hour! • Export razor sharp paintings at incredibly high resolutions, up to 128 megapixels (compared to 16 megapixels in basic version). Makes enormous printouts possible at unrivaled quality. 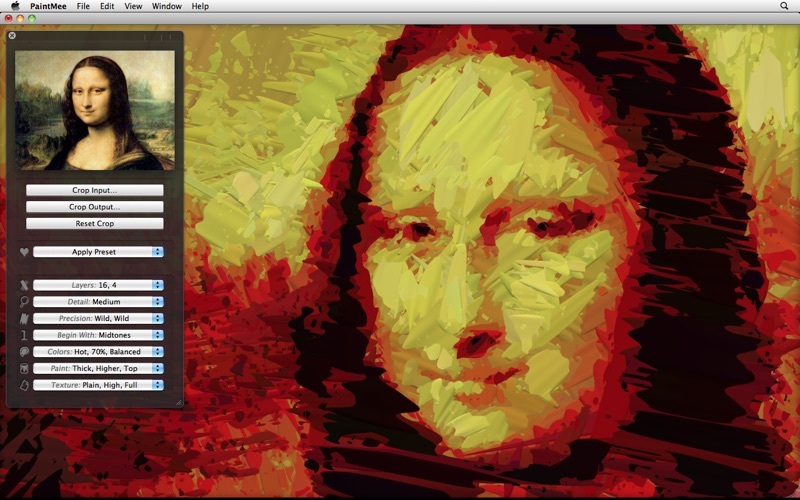 • Export paintings as layered Photoshop PSD documents. Have each layer of paint (up to 128!) isolated on a separate transparent background. Enables creative editing possibilities only limited by your imagination. • Enables an additional mode of extremely high painting detail. • Export the animations as movies. Capture the entire painting animations into full HD quality movies. Use durations from 1 second to 10 minutes. Incredibly cool! PaintMee aims to explore the borderlands between art, technology and entertainment. Come join the expedition! - Fixed a bug where fast successive setting changes could freeze the app.